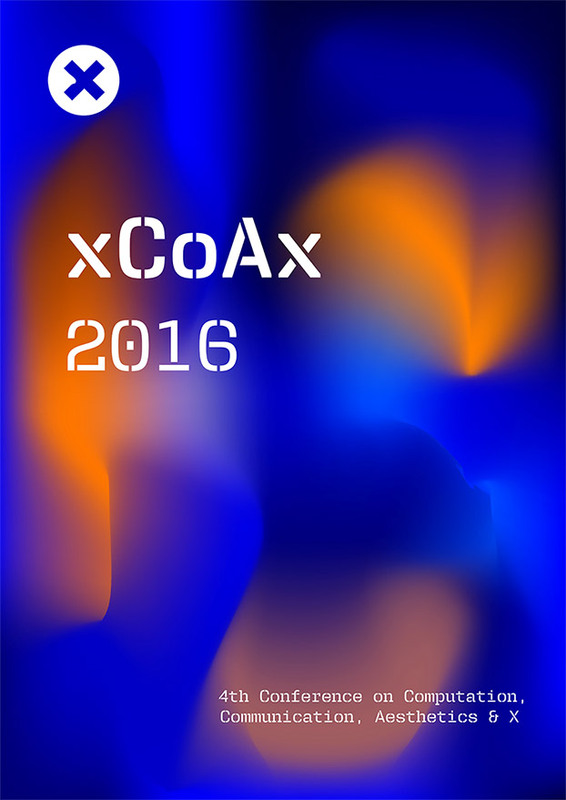 The proceedings of xCoAx 2016, the fourth conference on Computation, Communication, Aesthetics, and X, are now available at 2016.xcoax.org. Edited by Mario Verdicchio, Alison Clifford, André Rangel & Miguel Carvalhais. Designed by Maria Fernandes. ISBN 978-989-746-094-4. 412 pages. The xCoAx 2016 proceedings have just been published, including a paper by Ricardo Melo and myself. Digital interactive systems have systematically been designed in order to cater to the user’s desires, through user-friendly and user-centred design methodologies, privileging pleasurable and effective experiences. While this may be necessary and a worthy pursuit in many cases, it led to the rise of convergent systems focusing mainly on efficiency, productivity, and optimisation not only in those areas of our lives that require this mindset but to all areas regardless, relegating the interactor to the role a client experiencing a product, while limiting the creative and exploratory potential of the digital medium. In order to introduce divergency, we propose the concept of defamiliarisation as a method to reduce the predictability of interactions with digital technology, and suggest possible methods to accomplish it in interactive systems. The xCoAx 2016 proceedings have just been published, including a paper by Pedro Cardoso and myself. This paper is summary of our Ph.D. thesis, a work that proposes an analysis on the player-game system relationship through the perspective of an action-oriented framework. This framework is centred on the existence of actors, which are the entities through which action is enacted in the game, and in which the player and the game system are a part of. The grounding principles of this framework are seeded on a transition of action into experience, based on communicational systems that structure the dynamic formation of networks of actors from which distinct behaviours emerge, which, in their turn, promote the enactment of diverse sequences of events establishing narrative, which is a source of experience of the player. Chronology, responsiveness, thinking and actuation, transcoding, focus, depth, and traversal are the 7 dimensions we unveiled by focusing on the relationship of the player-game system pair through the lens of this action-oriented framework, a framework that, despite seeing both as actors, is able to consider their distinct natures and roles. We do not consider this work to be an ultimate theory of action. Above all, it is a proposal that video games can be regarded as action-based artefacts, a call to awareness for game designers that when designing for action they are working with the fundaments on which video games are built upon. 6 Elementos from Miguel Carvalhais on Vimeo. Becoming- from Miguel Carvalhais on Vimeo.